KATOWICE, Poland, Dec 14 2018 (IPS) - As negotiations at the United Nations conference on climate change come to a close, the highest expectation is that finally, there will be a rulebook to guide countries on what should be done to slow down greenhouse gas emissions that make the earth warmer than necessary, and how countries can adapt to the impacts of climate change. Africa is arguably the continent that is most impacted by climate change, experiencing storms, droughts, and floods; the emergence of new human and plant diseases as well as increased incidents of infectious diseases; unpredictable weather; and rising sea levels, among others. However, the 24th Conference of the Parties to the United Nations Framework Convention on Climate Change (COP24) raises one big question: Who is going to tell the African narrative of climate change? The UNFCCC secretariat has always allocated humble working space for the media, fixed with sufficient state-of-the-art computers, free high-speed internet and printing services, and an information desk to make lives of journalists easier in covering the conference. But African media has never been truly present at the conference to tell the real African story of the climate change discourse right from the negotiating room. “It is a shame for the media houses all over Africa to be relying on wire stories when addressing an issue that is of great importance to the African continent. It is totally unacceptable,” said Mohammed Adow, who heads climate policy and advocacy at Christian Aid. but only 1,068 turned up. However, out of these journalists some individual media houses brought in as many as 40 journalists. But looking at the represented media houses on the list, less than 30 journalists are present from African media houses. IPS contacted some of the African journalists who had registered and not attended. They said they had been prepared and eager to cover the event, but could not make it because of a lack of funding. “I was really prepared to cover the COP, but I couldn’t make it because I did not get a sponsor,” said Elias Ngalame, a Cameroonian journalist who won the very first Africa Climate Change and Environment Reporting (ACCER) Award in 2013, and has since been reporting about the COP processes. The same was said by Friday Phiri, an Inter Press Service award-winning environment journalist from Zambia, Michael Simire, a veteran environment journalist from Nigeria, and Agatha Ngotho from Kenya, among many others. From the entire East African region, including Ethiopia, only four journalists were available to tell the African narrative from COP24 for the African population. However, sometimes freelance journalists—as opposed to reporters permanently employed at media houses—are more likely to obtain funding to cover global conferences such as this because their stories have wider reach both locally and internationally. But they are oftentimes only sponsored to cover the events of their donors and only present for a short time. And on the other hand, African media organisations are still either unable to afford the costs of sending journalists to such events, or would prefer to cover local issues. 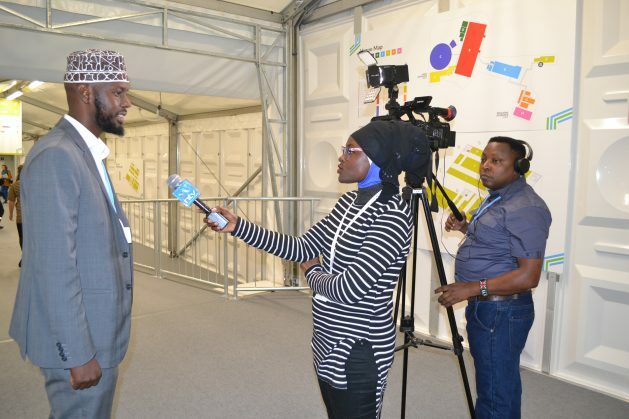 Mithika Mwenda, the Executive Director for the Pan African Climate Justice Alliance (PACJA), believes that African delegations must take responsibility and support at least one environmental journalist to accompany them. “Most of the people, especially in the villages who are affected by climate change, do not have time and sometimes capacity to read and understand content from scientific reports, specialised websites, the IPCC reports and so on. Instead, they listen to radio, they watch television and they read daily newspapers,” said Mwenda, whose organisation supported four African journalists to cover COP24. “So when delegates are coming here, they should think about how the messages they are passing across will be digested, simplified and given a human angle for that 90 year old woman in a rural African village to understand why things are not happening the way they used to when she was a teenager,” Mwenda told IPS. His sentiments were echoed by Ishaku Huzi Mshelia, an Energy Legal Expert from Nigeria who told IPS that the media is indeed indispensable when it comes to climate change negotiations. “Decision makers need to learn from the media. When we talk about something like the Talanoa Dialogue, we must have someone who will explain to the masses including policy makers what the term means, and why it is important,” said Mshelia. He observed that the Africa Union should take responsibility to support African journalists. “Journalists require training on the negotiation process, and resources must be made available if at all we are keen on passing the message from the discussion table to the people who desperately need to adapt to climate change,” he said. According to Mwenda, Africa has a significant number of journalists who understand issues around climate change, and they have constantly reported about the same from their various countries. “All we need is to fully involve them in such negotiation processes so that our narrative is not told by people who know less or nothing about the continent,” he said.